We’re so excited to introduce the newest additions to the Muppies marketing team! 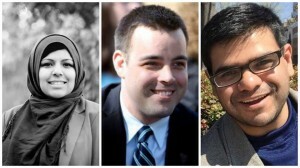 Please help us welcome Ayisha, Ben and Saeb! Ayisha (left) is the Education, Justice and Policing Policy Analyst for the Manhattan Borough President and a founding member of the Muslim Writers Collective. She comes to policy work with a strong foundation in community and youth organizing and believes in the potential for social change through relationship building and story-telling. Ayisha is a proud CUNY alum and current NYU grad student. What does Muppies mean to you? In two words, Muppies, to me means mentorship, and investment. Investment in each other as a community, as professionals, as Muslims, and I’m so excited to help share all of the amazing stories of the Muppies family having each other’s backs through career pitfalls, transitions, and promotions. Ben (center) is currently in strategic marketing at PwC and a Partner at Gotham Orient Partners. Ben has 15 years of experience in marketing and business development for professional services firms as well as serving multinationals and governments as a business and strategic consultant. He has advised clients across the globe is a Penn alum, a long time Board Member of the New York Hedge Fund Roundtable, and actively involved in a number of non-profit and philanthropic organizations. Over the years, I’ve met a number of personal friends through Muppies and have also successfully connected with a number of business partners via the email list, ranging from simply being able to make an introduction in Korea for someone seeking help to connecting with another member to put a cross-border transaction together. I’m excited to be involved because I’d love to give back to the group in any way that I can and help Muppies grow as a platform that aids us all in achieving our goals. Saeb (right) currently works at Accenture, and is part of a public sector change management team. He has experience in system integration testing and implementations for clients in healthcare, financial services, and the utility industries. Saeb studied at the University of Illinois at Chicago, where he headed the Collegiate Entrepreneurs Organization and co-founded an arts apparel venture, the Flux Collection, which eventually led him to be selected as a top five national finalist for Entrepreneur Magazine’s “College Entrepreneur of the Year” award. Upon graduating, he accepted a Fulbright Fellowship to study Turkish entrepreneurship and social responsibility at Koç University, Istanbul. Saeb has been active in several alumni, nonprofit, and civic engagement initiatives. It has been humbling to interact with many Muppies members, each trying to make meaningful impact across private, public, and nonprofit spaces. I am excited to be involved in marketing, and look forward to contributing efforts toward educational and professional development discussions for the global Muppies community.